Two golf cart-sized rovers named Opportunity and Spirit bounced to a landing on opposite sides of Mars in early 2004. From 200 million miles away, NASA scientists sent these robotic vehicles rolling about the rubble-strewn surface, poking their sophisticated instrument-tipped arms at rock outcrops, dunes, and dusty plains. Their mission: to search for geologic evidence that Mars was once a warmer, wetter, and perhaps even habitable planet. The prospect of life on Mars has captivated dreamers and visionaries for ages. Barely a century ago, astronomers and fantasy writers could peer into the night sky and imagine the red planet's mottled surface laced with canals or seething with warlike aliens set to invade Earth. In the 1960s, the first images beamed back to us by Mariner spacecraft quashed any lingering visions of canals or ruined cities. If we were ever to find signs of Martian life, it was clear we would have to search beneath the surface of an arid, bitterly cold planet with air too thin to breathe. A Viking lander did just that in 1976: it scooped up material from the planet's surface, analyzed it chemically, and found no clear evidence of life. That disappointment, however, did not quench our curiosity. Perhaps there was once a golden age on Mars, a warmer time when the planet nodded toward the Sun, polar ice melted, rivers flowed, seas surged, and life took hold. It was almost three decades later when ecstatic space agency scientists announced that Opportunity had found evidence that Mars once hosted water—not just soggy plains but a shallow equatorial sea or swamp of briny, acidic water that had left ripple patterns and salt deposits in surface rocks.1 For months I followed the news and watched online as the rovers beamed back startlingly clear images of the Martian surface. Captivated as I was, one seemingly trivial point kept jarring me. News reports and often the scientists themselves persisted in calling the loose stuff that the rovers were probing "soil." In this light, Mars enthusiasts are jumping the gun when they call the dust of that planet "soil." Theirs is an understandably hopeful act—a hope that the Martian surface contains, if not current life, at least a legacy of life. So far, however, such hopes linger unfulfilled. True soil, as ecologists see it, remains at least as rare in the universe as life itself. Indeed, life—abundant and long-flourishing life—must precede soil. It is life that substantially organizes and transforms the weathered parent material of the planet into soil. The only soil discovered so far is often called "earth" after the only planet on which it's found. Ironically, the money and vision expended on probing the secrets of Mars—$ 820 million for the latest two rovers alone—vastly exceed what has been spent exploring the earth beneath our feet. Yet it is the soils of our gardens, fields, pastures, and forests, as well as the sediments beneath streams, lakes, marshes, and seas, that harbor the most diverse and abundant web of life known in the universe. What's more, it is life underground that makes possible the green and fruitful surface world that allows us to create flourishing civilizations with the means and the curiosity to probe the universe. Although money for exploring soil life remains relatively sparse, the pace of exploration and sense of excitement are growing among scientists who look down instead of up. Like space scientists, soil ecol-ogists, too, are harnessing new technologies to reveal cryptic realms as little understood as the rusty skin of Mars—and far more vital to our existence. Unlike space exploration, however, the drive to understand life underground is fueled by a sense of urgency. Human activities are increasingly degrading and impoverishing soils and soil life, and this loss, in turn, threatens to diminish the earth's capacity to sustain us. Two-thirds of the earth's biological diversity lives in its soils and underwater sediments, and thriving underground communities keep the planet's surface green and habitable. reported in 1992, setting off a race of sorts to find the biggest "hu-mongous fungus. "12 By 2003, a 2,200-acre Armillaria in Oregon had captured the record.13 Finally, although we think of plants as denizens of our aboveground world, many plants spend more than half the energy they capture from the sun to grow roots that nurture and interact with life underground.14 A prairie, for example, grows more grass biomass below the surface than above. If scientists still know very little about who lives underground, they know even less about what each species in particular does for a living. Yet the creatures of mud and dirt are so important to our life that Wilson calls them "the little things that run the world. "15 Together they form the foundation for the earth's food webs, break down organic matter, store and recycle nutrients vital to plant growth, generate soil, renew soil fertility, filter and purify water, degrade and detoxify pollutants, control plant pests and pathogens, yield up our most important antibiotics, and help determine the fate of carbon and greenhouse gases and thus, the state of the earth's atmosphere and climate. All of these ecological services arise from the spontaneous activities of billions of creatures going about the business of nourishing and reproducing themselves in a series of elaborate food webs below the surface. Since the dawn of agriculture, humans have recognized the value of the soil itself, often invoking its fertility in ritual and sacrifice. Yet most societies have given little thought to, or have been simply unaware of, the multitude of creatures that live and work in the soil. The scientific study of soil developed in the 19th century, driven largely by the desire for greater crop production. Even soil scientists, however, have traditionally treated the soil as a "black box"—a system whose internal workings remain hidden or mysterious—measuring physical and chemical attributes such as pH and organic matter content, monitoring inputs of nitrogen and outputs of carbon dioxide, but making little effort to identify the dynamic workforce within. Yet we now know that these soil attributes and outputs reflect the legacy of billions of organisms eating, breathing, growing, interacting with one another, and, in the process, altering their environment—and ours. Today, a growing cadre of scientists drawn from numerous disciplines and armed with new techniques is working to crack open the black box of soil life and soil processes and fill in that sketchy outline with deeper understanding. Soil ecologists in the 1950s pioneered research on soil biodiversity, food webs, and soil-plant interactions, but since the 1980s that effort has burgeoned dramatically in parallel with the development of ecosystem science.16 Researchers today view soils and sediments as complex ecosystems, and they recognize that the processes that take place underground vitally affect not only our food and timber supplies but also the quality and sustainability of our environment. Soils and aquatic sediments now draw the attention of multidisciplinary teams of, for example, ecologists, biogeochemists, microbiologists, zoologists, entomologists, agronomists, foresters, marine and freshwater biologists, geologists, and atmospheric scientists. These researchers want to know who is down there, what each contributes to the functioning of the soil, how they are organized into communities and food webs, why some communities are richer in species than others, and how our activities threaten soil life and processes. Accelerating degradation of the earth's soils and sediments has not gone unnoticed by national and international organizations concerned with agricultural productivity, fisheries, food security, and poverty relief as well as biodiversity.20 Increasingly they recognize that defining, preserving, and restoring the health of soils and sediments are fundamental to addressing such problems as climate change, desertification, declining water quality, and the sustainability of agriculture, forestry, and fisheries worldwide. In turn, the health and quality of soils and sediments rely fundamentally on the work of the living communities within them. One of the international efforts that grew out of this concern is the Soil and Sediment Biodiversity and Ecosystem Functioning project led by soil ecologist Diana Wall of Colorado State University and sponsored by a nongovernmental scientific organization known as the Scientific Committee on Problems of the Environment (SCOPE). Since 1996, a wide array of specialists from around the world has volunteered time to the project to pull together what is known about the biodiversity of the earth's soils and freshwater and marine sediments, its role in sustaining vital ecological processes, and threats to soil organisms and the services they provide. This book is an outgrowth of that project, and access to participating scientists has allowed me to explore how human activities threaten the integrity of soil and sediment communities, and in turn, the critical services they provide to human society. The idea for this book grew out of a chance encounter in February 2001 when I happened upon Wall and John W. B. Stewart, a retired soil scientist and SCOPE editor in chief, outside a hotel conference room in San Francisco during a scientific meeting. I had already written one book based on findings from a SCOPE project and at the time was writing a second.21 Wall began telling me about the soil and sediment project and asked if I would like to get involved. How could I not be interested? Her enthusiasm for her science is infectious, and I'm an obsessive gardener, at least during the brief months when the soils in southwest Montana thaw. Furthermore, I had become fascinated by the link between biodiversity and ecological processes while working on my first SCOPE-sponsored book in the early 1990s. So little was known at that time about the ecological roles of specific soil creatures that SCOPE decided to launch a new effort—Wall's project—focused specifically on soil and sediments. The first question that occurred to me was would I be able to learn enough about soil life from the results of this second effort to fill a whole book? Wall assured me I would, and she followed up in the months ahead with stacks of journal articles and reports the project teams had produced. That material introduced me to a topic much larger and more significant than I had imagined. Almost 2 years later, in November 2002, I joined more than two dozen project scientists who had gathered at a lodge in Estes Park, Colorado, to synthesize what they had learned about soil and sediment biodiversity, its vulnerability to human activities, and strategies for its future conservation and management.22 That was my first opportunity to mingle with people who "see" below the surface and are aware of and concerned about the underground world. I began to probe for details, to look for situations and stories that would illustrate the work of soil communities and their great relevance to our own well-being. From Estes Park, my explorations of life underground took me to the polar desert of Antarctica, the coastal rain forests of Canada, the rangelands of Yellowstone National Park, the vanishing wetlands of the Mississippi River basin, Dutch pastures, and English sounds. This was not a journey of lament through ruined landscapes but an opportunity to walk and talk with scientists and land managers who are pioneering ways to integrate new knowledge about soil life into efforts to restore, sustain, or monitor the health of our lands and waters. In this book you will hear from a marine ecologist who monitors the work of burrowing shrimp in Plymouth Sound in hope of gaining more protection for important mud-bottom creatures everywhere in the debate over acceptable fishing practices; learn about researchers in England and the Netherlands who are trying to reverse degradation caused by intensive agriculture on former croplands; follow Canadian forest ecologists as they explore the fate of root fungi vital to forest regeneration in stands logged using controversial "new forestry" techniques; and join ecologists tracking the destructive advance of exotic earthworms through a Minnesota sugar maple forest. Some 4.5 billion years ago, swirls of hot interstellar gases and dust began coalescing to form Earth and our solar system.23 For hundreds of millions of years thereafter, massive chunks of rock or ice continued to batter our young planet, periodically melting its crust or boiling away the warm oceans that formed in million-year torrents as the planet cooled. By 3.9 billion years ago, those collisions had grown rare and continents began to rise. Earth was still hot, its atmosphere devoid of free oxygen and lacking a protective ozone layer that could buffer the molecule-shattering ultraviolet radiation from the young sun. Somewhere on the planet, however, life was in the making— perhaps in warm shallow coastal waters, in the open ocean, in hydrothermal vents bubbling from the seafloor, or even deep under ground. Wherever it arose, though, this early life itself helped transform Earth into the uniquely habitable planet we enjoy today. By 3 billion years ago, communities dominated by mats of cyano-bacteria thrived in the shallow waters of the planet. Cyanobacteria —once called blue-green algae—are ubiquitous in the earth's soils and waters today, visible in forms ranging from pond scum to living crusts on the desert floor. They pull the nitrogen they need directly from the air and also make their own food through photosynthesis just as green plants do. Using sunlight for energy, these single-celled creatures breathe in carbon dioxide, strip the carbon from it, and use the carbon to assemble sugars and other organic compounds needed to build and fuel life. In the process, the microbes discard the oxygen molecules from the carbon dioxide, creating what paleontologist Richard Fortey calls "the most precious waste in the firmament. "24 Over a billion or so years, the exhalations of microbes created the earth's oxygen-rich atmosphere and protective ozone layer that allowed more complex life to evolve. With the so-called Cambrian Explosion 530 million years ago, animal life came into its own, arising and proliferating in the waters and muck of the seafloor. Some 400 million years ago, the descendents of that explosion began to emerge onto land. In the vanguard were the ancestors of many of today's underground dwellers—tiny flat-worms, springtails, mites, pseudoscorpions, spiderlike creatures, and the scurrying predecessors of modern insects (many of which live part or all of their lives underground). By 350 million years ago, the first green plants arose, and together with microbes and animals helped to drive creation of the vital soil systems we rely on today. As the roots of plants and their microbial followers pushed ever deeper into the soil, the carbon dioxide they exhaled reacted with rainwater, creating acids that helped to weather the rock of the earth's crust into sand, silt, and clay minerals. Those minerals, combined with air, water, and organic matter from decaying plant and animal material, along with living organisms, are the key constituents of soil.26 It takes hundreds to thousands of years to create soil from rock, depending on its hardness; sandstone or shale clearly yields faster than granite. The process of soil formation is so slow relative to the human lifespan that it seems unrealistic to consider soil a renewable resource. By one estimate, it takes 200-1,000 years to regenerate an inch of lost topsoil.27 That is one reason both ecologists and agronomists become alarmed at farming or construction practices or other human activities that promote excessive erosion of topsoil. Scientists classify the earth's soils, like its life forms, into an intricate and constantly shifting taxonomy. There are 11 major orders of soil, from the dark, fertile Mollisols of temperate grasslands to the highly weathered yellow Oxisols of the humid tropics. Within these orders are numerous subcategories encompassing tens of thousands of distinct soil series worldwide, more than 13,000 in the United States alone. 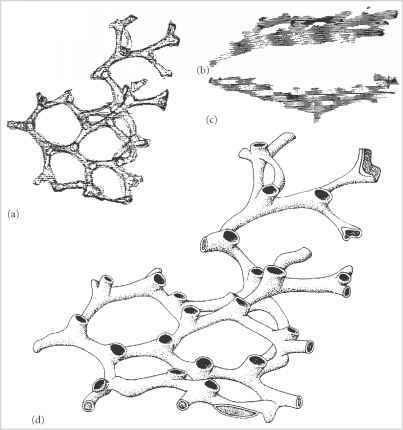 Each soil series is equivalent to a biological species, and the "profile" of its horizontal layers or "horizons" represents a unique interaction of climate and life with parent rocks and topography in a specific place through time. The result is a soil with unique texture, structure, organic matter content, and living communities.28 In turn, the character of the soil helps determine whether we encounter fir forests, grassy savannas, or sagebrush above, and whether the land can be converted to grow wheat or tomatoes or oranges. Until recent decades, soil science focused primarily on agriculture, and only the organic-rich upper horizons to the depth of crop roots were considered soil. 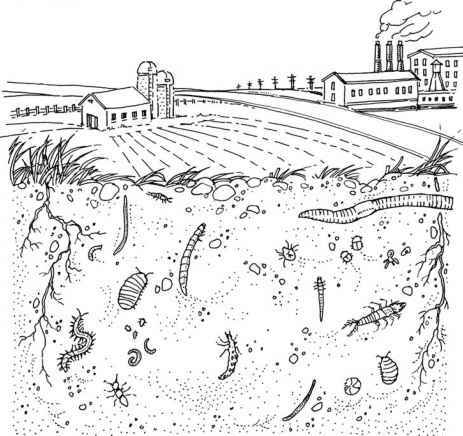 Now the definition of soil is being pushed ever deeper into the earth by scientists concerned with everything from the influence of deeply rooted plants and deep-dwelling microbes to groundwater supplies and the fate of pollutants. Some disciplines define the lower limit of the soil at about 6 feet, whereas others see the zone of biological influence extending 30 feet or even hundreds of feet into the earth's crust.29 Increasingly, scientists recognize that life deep underground can influence everything from the quality of our water supplies to the character of life aboveground. If more effort has in the past been spent classifying the soils of the earth than examining the work of the living communities within, that is changing rapidly, and the modern efforts to shed light on the black box of the soil are the focus of this book. Paradoxically, the below-ground life that we have long ignored or taken for granted is not only more important for our survival, but arguably as bizarre and alien as anything we are likely to find in the dust, ice, or seas of another planet. It seems fitting then to begin the story of life underground with a visit to scientists who are probing the soils of the most Mars-like place on our planet, a continent once lush and temperate until geologic forces drove it into its present position at the end of the Earth.